Is a Dining Revolution Happening Outside of Boston? A weekend away to Portsmouth, New Hampshire may be exactly what your taste buds need. Portsmouth may be just an hour’s drive from Boston (assuming you don’t get caught in traffic with other city-fleers), but it feels like a true escape. You’ll find tourists starting their days with coffee and a stroll through cobblestoned Market Square, and locals slipping out of work early to soak up the last of the seaons sunny rays and sip cold brews on the waterfront decks. 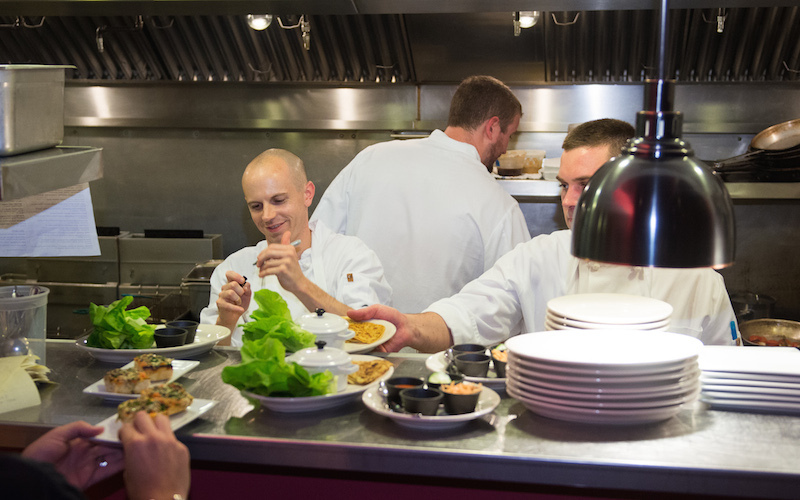 Downtown Portsmouth has always held historic charm in spades; from the tugboats in the harbor to the quaint side streets lined with lovingly kept 17th century homes, but in the past several years, the small city has seen a kind of dining revolution. You’ll find James Beard-nominated chefs cooking up American tapas, professional BMX bikers pressing organic juices, and acclaimed Boston restaurateurs opening outposts to serve up sparkling New England seafood, far from the stresses of the city. 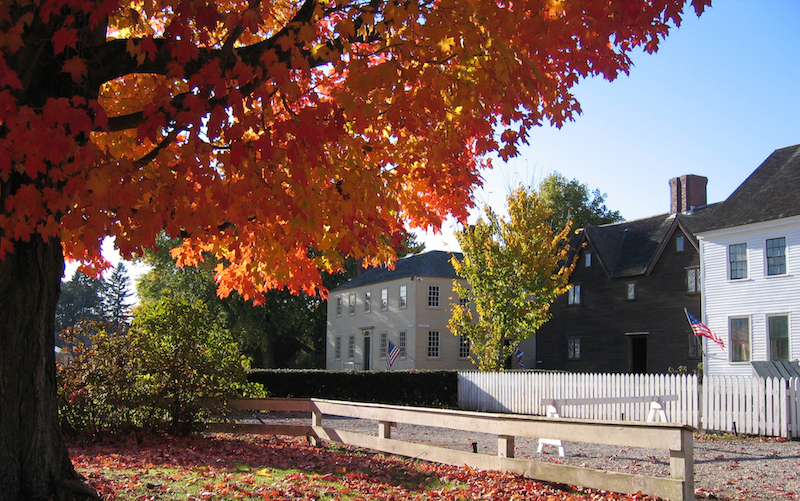 After a day of walking trails and chasing waves at Fort Foster, or time traveling to the Colonial era at Strawberry Banke Museum, you’re going to be hungry. Not to worry, we’ve got you covered. Here’s your food-centric guide to a weekend away in Portsmouth New Hampshire. If you are lucky enough to sneak out of work in time to beat the commuter traffic, you’ll arrive at The Hotel Portsmouth for check-in at 3pm. 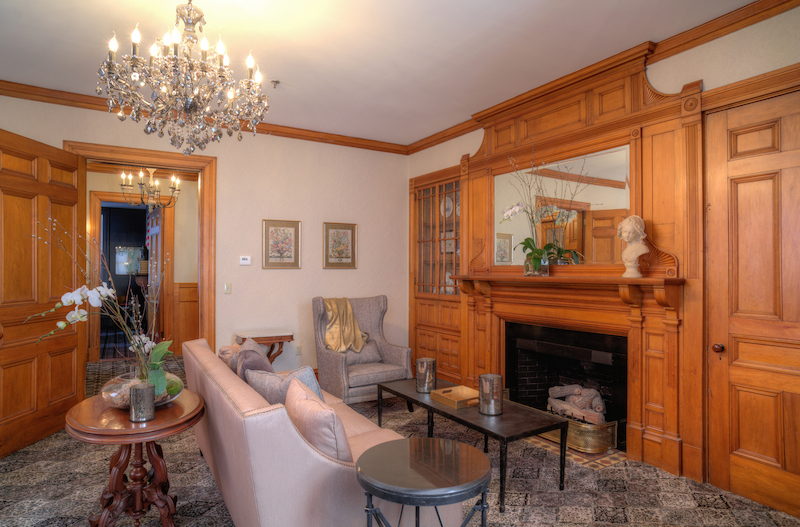 Get settled into a comfortable room in this 1881 mansion turned boutique inn. Intricate woodwork and crown molding ooze Victorian charm, while cheery wallpaper and cozy furniture in the multiple common sitting areas provide inviting modern comforts. The well-appointed rooms have luxe bedding, wi-fi connected ipads, and cute touches like mason jars and carafes to fill at the help-yourself water and seltzer taps in the breakfast room. A casual continental breakfast buffet is included in your room rate. We settled in to wingback chairs in the parlor with coffee, fruit and freshly baked banana bread on Saturday morning to plot the weekend. Happily, the hotel has a dog-friendly room, and our pup Scout seemed to enjoy the stay as much as we did. Start your morning as the locals do, sipping in-house roasted coffee at “BNG.” The café is located in the heart of downtown’s Market Square, with plenty of outdoor seating and great people (and puppy) watching. 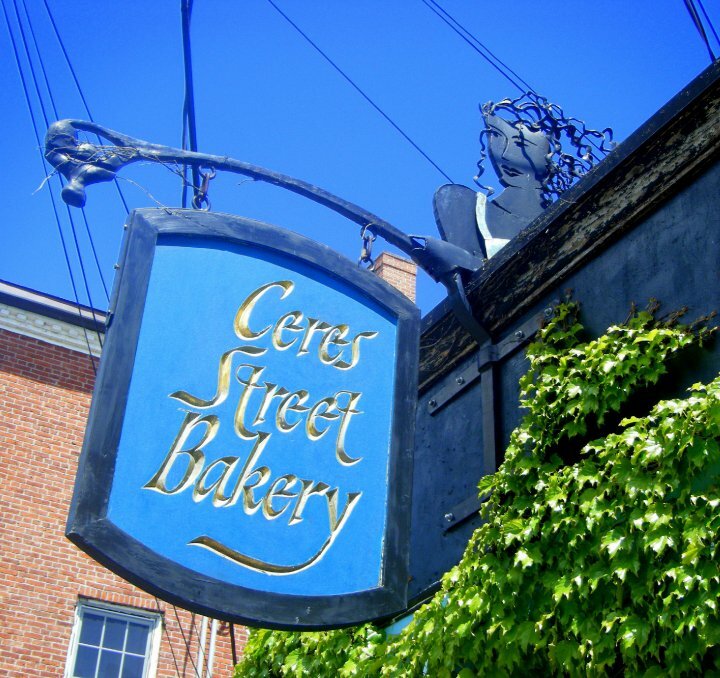 This quaint little bakery just off the main drag, has been turning out fine sweet and savory baked goods for over 30 years. Try one of their decadent mint-chocolate brownies, or take home a loaf of the molasses-kissed andama bread. Be sure to hit the ATM first, this spot is cash only. This organic juice and smoothie bar is run by local BMX bike pro Aaron Smith and his father Ken. Though Aaron has traveled around the globe riding professionally, this new business venture has allowed him to put down roots in his native New Hampshire, while fueling his healthy athletic lifestyle. 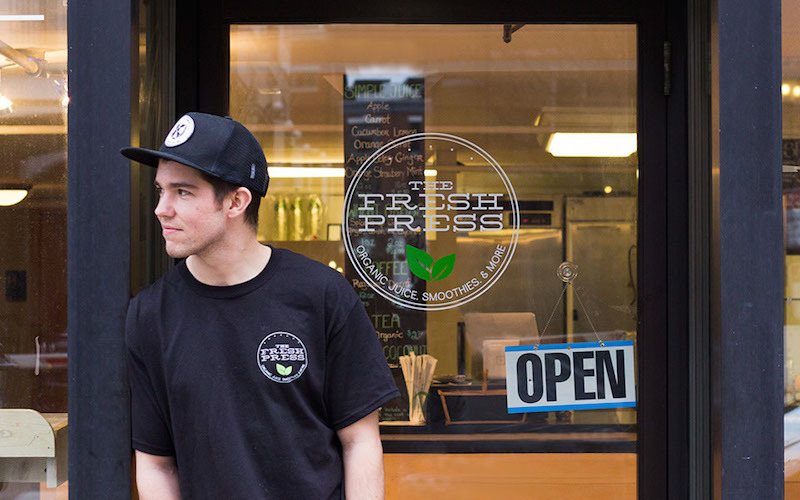 The Fresh Press serves organic smoothies, salads, acai bowls, and of course, juices. Try the Secret Green, which looks like the kale and spinach it contains, but tastes like a tropical vacation thanks to the addition of pineapple, apple and fresh mint. The team behind Island Creek Oyster Bar and Row 34 Boston opened a Portsmouth location this spring, but it already feels like a neighborhood staple. 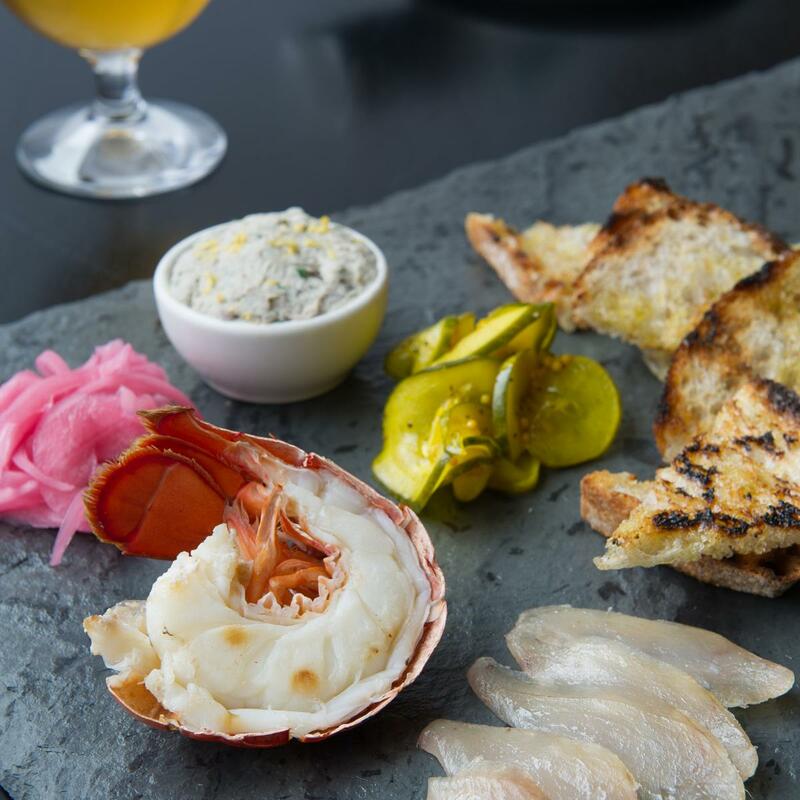 You’ll find classics you’d expect from chef Jeremy Sewall – oysters on the half shell, smoky clam chowder, hot buttered lobster rolls and grilled whole fish, and unlike the Massachusetts outpost, they have a full liquor license. We sipped a sophisticated take on that tropical treat, the painkiller. Made with best quality booze, fresh juices, and pineapple cream over crushed ice, it will really make your weekend get-away feel like a vacation. End the meal with a dessert courtesy of their own soft-serve machine, which turns out an artisan version of the chocolate vanilla twist with your choice of classic toppings. This modern American tapas restaurant serves up small plates like Maine Peekytoe crab with ramp top coulis, grilled ramps and marinated cucumber, and roasted beef bone marrow with onion jam, banana peppers and pea shoot salad on grilled bread. It's headed up by 2015 James Beard semi-finalist "Best Chef Northeast", Matt Louis, who was born and raised in the Granite State, but brought up in the kitchens of internationally acclaimed Thomas Keller. Moxy is a winner, bringing sustainably sourced, sophisticated (but un-stuffy) dishes to the Seacoast. Take a trip back in time at this recreated historic community, which includes 42 restored structures from the late 17th to the mid 20th centuries. The Museum is staffed by interactive employees and volunteers dressed in period garb to give you a feel for what life was like in New England in bygone eras. With garden tours, workshops in candle making and hearth cooking, and loom demonstrations, the indoor/outdoor museum is a fun, educational way for the whole family to spend a day in Portsmouth. 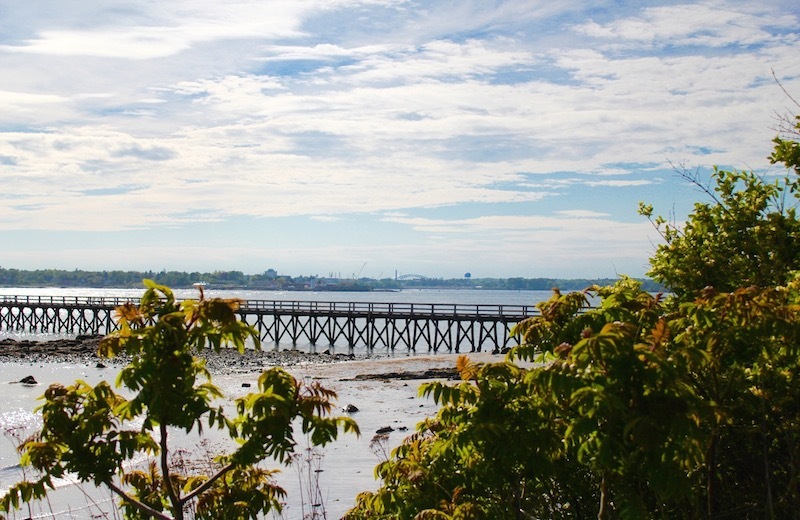 Take a 20 minute scenic drive across Memorial Bridge, along the southern Maine coast to Fort Foster Park in Kittery. The $10 per car admission (for non-Maine residents) gets you access to two rocky beaches, walking trails, and shady picnic spots. Whether you want to splash in the waves with your pup (the park is dog-friendly), fly a kite, or bird watch along the sea grass, this pristine park is worth crossing another state line.